Since the early days of Vampirella there has been a Vampirella Fan Club of some sorts. Warren publishing kicked it off, and Harris continues the tradition with the current Scarlet Legion. Part of your members pack was a card with room for you to write your name, and that's just what many people did. The most sought after membership cards are blank ones. 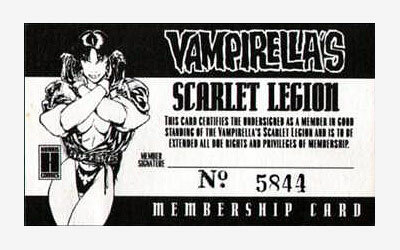 Started in 1971, the Vampirella fan club had a number of benefits (and I'll tell you what they were once I've checked just what they are LOL). Again, membership to the Scarlet Legion (Harris Comics' official fan club) comes with a membership card. The one I have is for member #5844, and I would be curious to know to whom it was originally issued.